We woke up early (again) on our last full day in Japan to meet Neil, of Tokyo Bicycle Tours, for a four-hour, 22km “Central Culture” bike tour. Neil had a perfect-sized bike for Rowan, plus a helmet, and two bikes for us, and took us on a private bike tour along the Meguro River, which was lined with cherry trees in full blossom; through Shibuya, where Rowan handled cycling through crowds like a champ; and Yoyogi Park, Tokyo’s largest green space, also full of cherry blossoms. 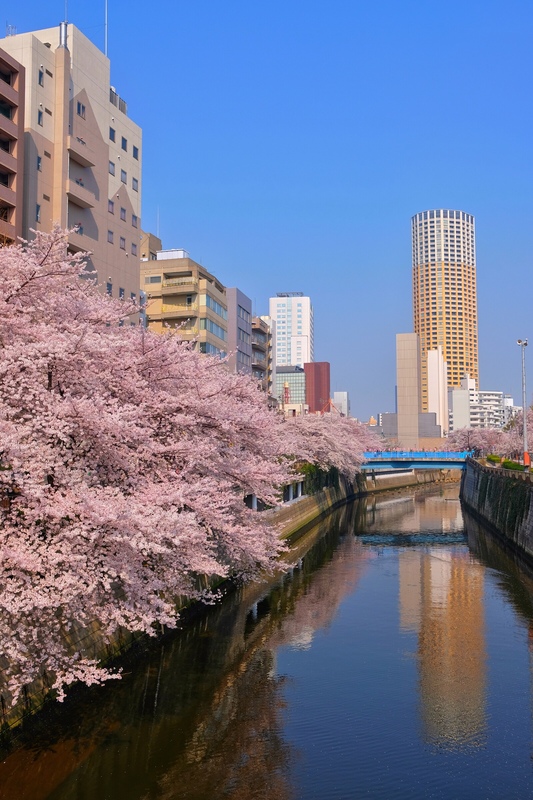 Cherry blossoms along the Meguro River. 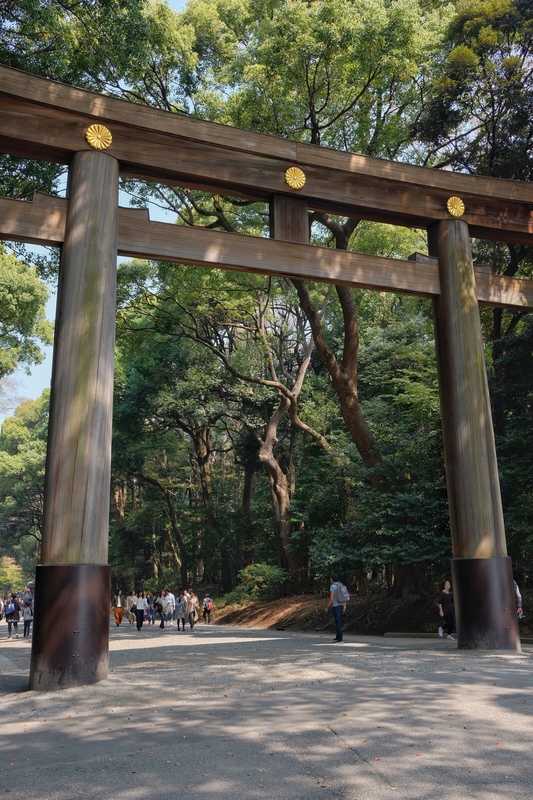 Next, we rode to the Meiji Shrine and walked the wide gravel path lined with tall trees to Tokyo’s most famous Shintō shrine, dedicated to the Meiji Emperor after his death in 1920. It was beautifully spare and simple, with huge halls and buildings forming a main square, where many people come to hold Shintō marriage ceremonies. The main gate to the Meiji Shrine. 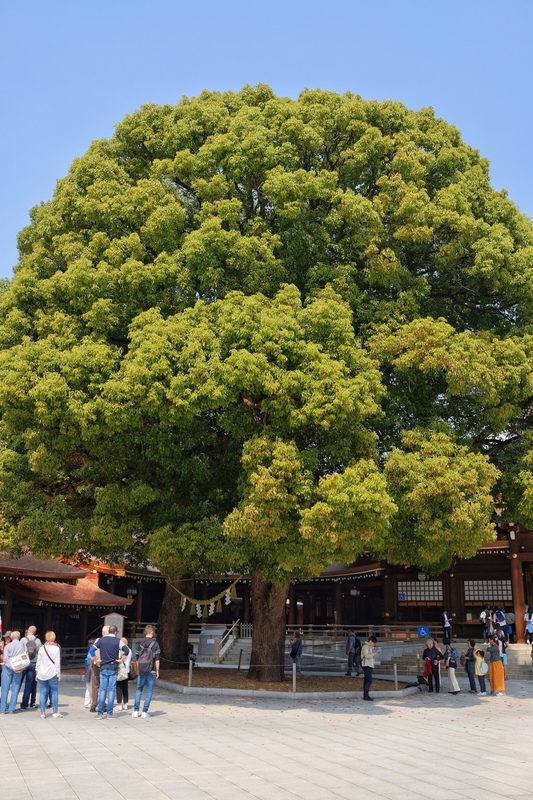 One of the most beautiful elements of the shrine is these two, massive Camphor trees, planted in 1920, when Meiji Jingu was enshrined and are considered sacred. The two trees are known as the “husband and wife” trees and are symbols of happy marriage and harmonious family life. Needless to say, mamma, made sure to offer a small donation and a prayer in the main hall in honour of the trees! The “husband and wife” trees at Meiji Shrine. Then, we were off to Harajuku and Takeshita Dori Street, where we had lovely crepe desserts along the incredibly crowded street that features shops for teenage girls (lots of Hello Kitty and Japanese boy band shops). It was super fun. Then Neil took us to a batting cage centre at Meiji Koen Park, where we all got to try to hit about 20 baseballs each, coming at us from behind video screens as if from actual Japanese baseball league pitchers. We all managed to hit a few balls, even Rowan, who’d never swung a bat in his life! He was very proud. Cherry trees everywhere! 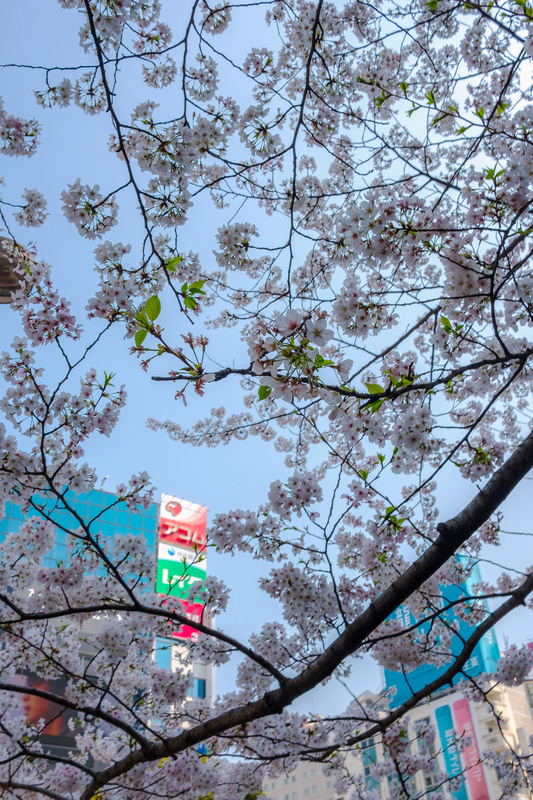 Cherry blossoms in Shibuya. The last stop was the Aoyama Cemetery, Tokyo’s first cemetery of the Meiji period, where residents of the Aoyama district rest their deceased in family plots. Neil explained where each monument has spots for flowers, offerings of food and even mail to be delivered to the deceased, which was fascinating. It was also beautiful, because the main road through the cemetery is lined with more gorgeous cherry trees in full blossom. It was a perfect day for cherry blossoms, in fact – warm and sunny and without a cloud in the sky, and we felt very lucky that we could spend our last day in gorgeous Japan surrounded by such beauty. Sounds like so much fun and the cherry blossoms are gorgeous beyond belief! Thanks, Tamsin! The cherry blossoms are extraordinary, especially when there are so many of them and in such gorgeous settings. It was incredible to ride bikes underneath them. I think we all had big smiles on our faces the entire time! What absolutely stunning photographs! I’ve never been to Tokyo, and had no idea it is this lovely. This was our first time to Tokyo and all three of us, even our 9-year-old, have decided it won’t be our last. The very touristy parts that everyone goes to are a must, for sure, but there are also absolutely lovely, amazing, gorgeous, neighbourhoods that still tug at our heartstrings. We miss them so much, and we were only there for, like, a day. The food everywhere is incredible, everyone we met was gracious and kind, and cycling around the city with Neil was astoundingly beautiful. We’ve decided we’re going to take bike tours wherever we travel from now on! You should totally go to Tokyo, Jeff! !